Miss Magnolia Beatrice Deveraux Beaumont is nothing if not proper. She is, after all, a debutante. Imagine her surprise at finding herself, after her untimely death on the cusp of the Civil War, not in heaven as she expected, but an unwilling passenger in the body of a gay man living in Manhattan in the 21st century. It's enough to make a lady clutch her pearls and reach for the smelling salts. In Joe Hutchenson's charming one-man play, the audience follows Miss Beaumont and her host, Joe, on his birthday vacation to Provincetown. He sees this vacation as a chance to connect with someone, perhaps even to find some happiness that has been missing in his life. Miss Magnolia doesn't know why she's been placed in this body, but she voraciously consumes every morsel of Joe's completely alien lifestyle. As she starts to experience Joe's senses and is eventually able to communicate with him, she discovers that it's never too late to live a useful life. Hutchenson is an excellent actor. His Miss Magnolia is sweet as honey and as proper as a lady can be (she's even working on an etiquette book). That she never strays into camp says a lot about his ability as an actor and his empathy for this character. Miss Magnolia is not to be ridiculed, nor is she merely a comic means to an end. Joe, also, is a fully fleshed out character - a gay man, alone on his birthday and recognizing the writing on the wall as his youth starts to fade. He's a man in need of support, even if it is of the supernatural kind. In addition to being an effective actor, Hutchenson is a marvelous storyteller. Miss Magnolia's description of her first few moments in Provincetown transported me to the place. I could picture the streets and the crowds, smell the food and the sea air. 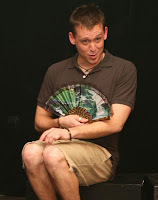 With few props and set pieces, Hutchenson himself becomes the ultimate set designer, inviting the audience to see through his (and Miss Magnolia's eyes). Under the able direction of Cheryl King, and with support from Ellen Rosenberg's strong lighting and sound, Miss Magnolia Beaumont Goes to Provincetown is an outstanding production.